MONROE, WIS. — Monroe Truck Equipment Inc. recently announced it has acquired Towmaster Inc., based in Litchfi eld, Minn., a leading manufacturer of high-quality tag and large fifth-wheel trailers for the construction and rental markets. In addition, Towmaster is a manufacturer, distributor and installer of truck equipment for the municipal and commercial markets specializing in snow and ice related equipment. Monroe is a designer, manufacturer, distributor and installer of specialized truck equipment. The company upfits heavy-medium-and-light-duty vehicles for municipal, commercial and fleet customers. Monroe is a portfolio company of Industrial Opportunity Partners, an operations-focused private equity firm based in Evanston, Ill. The company will remain based in Monroe, Wis. 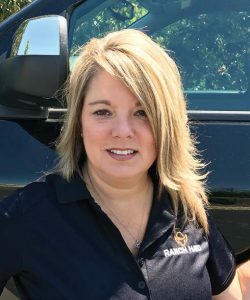 The acquisition of Towmaster will add the Litchfield, Minn., location to its installation facilities in Marshfield, Wis.; DePere, Wis.; Flint, Mich.; Joliet, Ill.; and Louisville, Ky.
Robin Krimminger has joined Ranch Hand as outside sales representative for the North Carolina, South Carolina and Virginia areas. Krimminger has worked closely with national and regional automotive aftermarket warehouses for over 15 years. Her experience includes sales, business development and market launch and trend analysis. “Robin has unique and broad industry knowledge. Her experience is in product-based knowledge, understanding new market areas as well as the distributing and manufacturing processes,” Vice President of Sales Scott McClaugherty said. “Robin is a forward-thinking individual that truly understands the nature of our aftermarket industry, and the way it will shape our future,” McClaugherty added. Robin holds numerous aftermarkets automotive certificates and attended Central Virginia College in Lynchburg, Va.
SAUK CENTRE, MINN. — In early April, Ben Myhre, a welding trainer for Felling’s Weld Training Center, and Kyle Wald, the vice president of engineering for Felling Trailers Inc., obtained their Certified Welding Inspector Certifications through the American Welding Society. Myhre will utilize his CWI certification to provide a higher level of training for the welding students he teaches at Felling’s Weld Training Center. For Wald, the knowledge gained from the CWI certification will play an intricate part in engineering Felling’s extensive model offerings. The pair will also work together to create a set of Felling Trailers Certified Weld standards that will be implemented throughout the company. “Our long-term goal is to become an AWS Certified shop,” Wald said. Myhre and Wald completed approximately 80 hours of online training covering subjects such as Fabrication Math I; Fabrication Math II; Metallurgy I: Fundamentals; Safety in Welding; Science of Non-Destructive Testing; Understanding Welding Symbols; and Welding Fundamentals. Following this, the two then completed an additional 40-hour Certified Welding Inspector seminar that took place at a testing/training center in Bloomington, Minn.
“Having Certified Welding Inspectors on our team demonstrates Felling Trailers’ commitment to its quality standard and customer satisfaction. 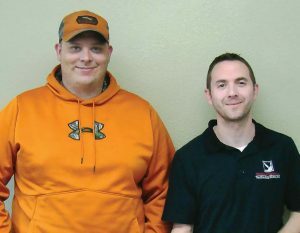 Ben and Kyle’s accomplishments took much effort, and all of us at Felling Trailers, Inc. commend them on their achievement,” said Brenda Jennissen, CEO of Felling Trailers Inc.
For information, visit www.felling.com, or call (800) 245-2809. NASHVILLE, TENN. — Aries Clean Energy’s biomass gasification plant just outside Nashville has been recognized as the driving force behind the city of Lebanon’s receipt of a 2017 Governor’s Environmental Stewardship Award, the most prestigious conservation award Robin Krimminger in Tennessee. Now in its 31st year, the awards annually showcase exceptional voluntary actions that improve or protect the environment. Governor Bi l l Haslam and Tennessee Department of Environment and Conservation Commissioner Bill Martineau jointly announced the award in the energy and renewable resources category after a panel of 22 independent professionals, representing conservation, environmental, agricultural and academic sectors, judged nearly 90 entries from across the state. Aries Clean Energy deployed its patented gasification technology in design and construction of the plant that was commissioned in late 2016. 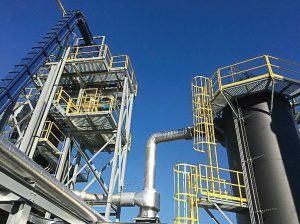 It is the world’s largest downdraft gasification facility, and it utilizes a blend of wood waste from local industries, scrap tires from Wilson County and biosolids from the city’s wastewater treatment plant to produce green electrical power. Developing the project involved implementing a partnership between the city and county, as well as a private company, Rockwood Recycling, which specializes in logistics and preparation of commercial wood waste and scrap tires. The gasification plant can process up to 64 tons per day of material and produce 420 kW of electricity utilizing Organic Rankine Cycle generators. Because of the partnerships in place, the Lebanon facility annually diverts 8,000 tons of wood waste from the landfill, enough to fill a line of tractor-trailers four miles long; makes beneficial use of 36,000 scrap tires; eliminates 2,500 tons of carbon emissions from the air, equivalent to that produced by 479 automobiles; and generates 1.8 million kilowatt-hours of electricity – sufficient to power 350 average homes for the year. KANSAS CITY, MO. — The American Public Works Association announced the 2017 Top Ten Public Works Leaders of the Year, which are recognized for the career service achievements of public works professionals. The Top Ten Public Works Leaders program focuses on outstanding career service achievements of individual public works professionals and officials from both the public and private sectors in North America. Each of the Top Ten Leaders are recognized for their accomplishments in federal, state, provincial, county or municipal engineering or administration, including career advancement, contribution to technology or job knowledge, commitment to the profession as evidenced by education, training, certification or registration and continuing education, as well as professional excellence and service to the community in large and small municipalities. This year’s APWA 2017 Top Ten Public Works Leaders list includes David Fabiano, P.E., PWLF — town engineer, town of Gilbert, Ariz.; Lee Gustafson, P.E. — senior project manager, WSB & Associates Inc., Minneapolis, Minn.; Patricia Hilderbrand, P.E. — division manager, coordination services, public works department, Kansas City, Mo. ; Richard Howard, CFM, P.E., PWLF – public works director, city of Orlando, Fla.; Paul May, P.Eng. — chief engineer, York Region Rapid Transit Corporation, Markham, Ontario, Canada; Robert Newman — director of public works, city of Santa Clarita, Calif.; Jeanne Nyquist — president, Nyquist & Associates Inc., Tigard, Ore.; Darren Schulz, P.E. — director of public works, city of Carson City, Nev.; Kevin Sheppard, P.E., PWLF — public works director, city of Manchester, N.H.; and Larry Stevens, P.E., PWLF — project director, HR Green Inc., Johnston, Iowa. News releases regarding personnel changes, other non-product-related company changes, association news and awards are printed as space allows. Priority will be given to advertisers and affiliates. Releases not printed in the magazine can be found online at www.themunicipal.com. Call (800) 733–4111, ext. 2307, or email swright@the-papers.com.